Let’s have a look at our next list of interesting startup ideas. They include a wholesale goods delivery service, a magic food vending machine, an app for places discovery that makes you feel like a local, a messaging app that allows to leave surprise messages all over town and a shoe design factory that delivers the footwear of your dreams. When people are about to buy a box of goods, they usually need to invest quite a lot of time, gas and money. But Boxed saves all these expenses by putting wholesale door to door shopping into an app. Boxed is a mobile commerce startup that enables customers to purchase wholesale goods and have them delivered to their doorsteps. Boxed doesn’t run an e-commerce website and is available only through mobile phones. It has two warehouses owned by itself carrying 800 items each and promises to deliver wholesale goods to anywhere in the continental USA in 2 days. Small and mobile, but with a different approach to wholesale shopping and huge funding, Boxed seems to be getting ready to become a real challenge for big retailers like Costco or Walmart. Among the things that all girls like, shoes occupy a special place. Footwear is exactly what can make women go crazy, in a positive sense. I am not any different, that’s why Shoes of Prey totally grabbed my attention. If you are a female, you should know how long it usually takes to pick out the shoes that fit your taste and the shopping experience can sometimes end up being negative. But Shoes of Prey are exceptional. Their site lets you not only choose shoes from a huge number of options, but also design your own custom footwear. Shoes of Prey will craft your personal 3D creation using premium materials and get this pair of shoes delivered to anywhere in the world. You can create any style of footwear, customize the details, heel type, decorations, fabric and a whatever else. It may get hard to make a choice given all those options on Shoes of Prey’s website, but they have a very nice «style advice» section with short articles helping you to get the answers to shoe-related questions. Pantry is a startup that looks like a fridge and a food vending machine. However, it has something different to offer speaking of its content and the process of buying it. Instead of chips, candy bars, and cola, Pantry sells fresh food. 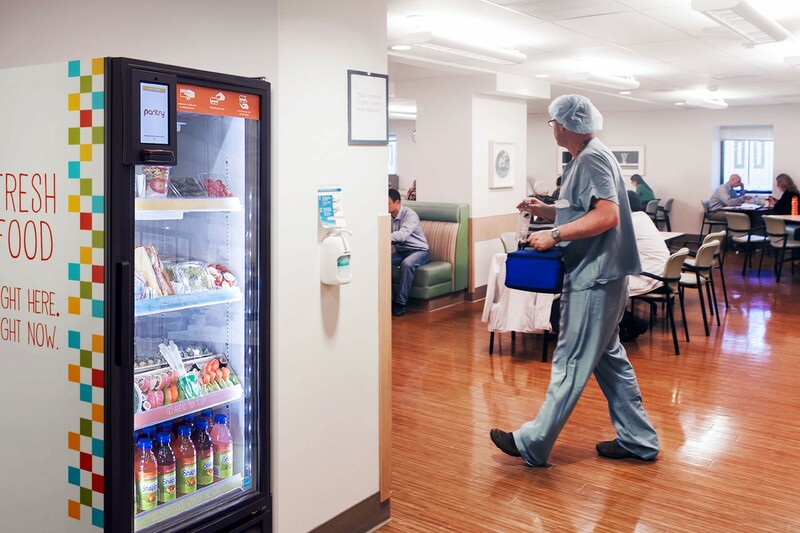 Organizations like hospitals, schools, airports, gyms, universities, usually have a cafeteria, but you probably know how crowded it may get at certain hours. Pantry can expand the reach of cafeteria and make fresh food available anywhere anytime. But even more amazing is the technology Pantry uses. In order to get the food out of the fridge, it’s enough to swipe your credit card and grab what you want. That’s all. Their food vending machine uses a modified Android tablet with a credit card reader attached to it and RFID technology that detects what was taken out and automatically charges the card. You don’t have to enter the item you are going to take, nor worry about its freshness. Pantry knows when different food items were placed into the fridge and when they need to be restocked or replaced. Time to revolutionize the world of food vending machines has finally come! Apart from having a million dollars in funding and my name in their website’s URL, Kate’s Goodness has also quite an interesting idea that I hope to see on the app store soon. 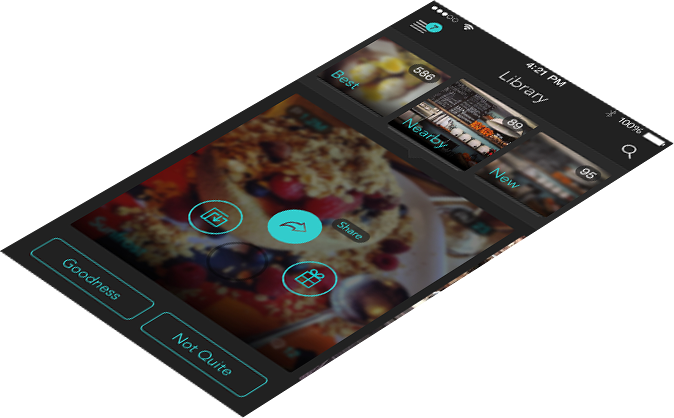 The app is a location based service aimed at creating positive local experience for people landed in a new place. Recommendation based places discovery apps are not new but Kate’s goodness has some fun gamification features that are likely to incentivize users. You can read, write and trade Goodness posts in the app. Anyone could become a writer but Kate’s Goodness will share only curated posts from trusted writers thus providing quality and noise free short form content. Writers and virtual owners of the collections which they can trade for points, share the revenue generated from physical Goodness locations. The owners of the latter will be offered a subscription to Kate’s Goodness services that will include analytics, reservation and delivery systems integration, as well as other promotions. Messaging apps are really popular today, from Whatsapp-like to applications with ephemeral self-destructive messages. But what about location based? Drop Messages is the winner of the TechCrunch Boston Pitch-Off and an app that can surprise you while you are traveling or just moving around. The idea is to leave and send messages to friends only when they are in a specified geographic location. You can drop a message to a group of people as well as to a single person telling them whatever you wish, attach pictures and comment. So far, the app seems to have picked up some organic traction with users in over 60 countries. Dropping messages sounds like fun! Looking forward to seeing it on Android!